We live in a highly digitalized world where you will rarely see anyone without a smartphone in their hand. Cellphones have now become the instrument of choice for communication, to conduct business, to surf the web and to check out social media sites. However, a phone and a phone plan can be pretty expensive. But with websites such as Simply Cellphones, almost everyone can now afford to own a phone. Read our Simply Cellphones review to find out how. Simply Cellphones Throughout the U.S. There are numerous types of cellphones available in the market, and costs vary based on brand, model, memory, complexity, and features. Some cellphones such as the Apple iPhone can cost up to $1,000. The importance of having a cellphone cannot be understated. Cellphones are very handy for almost any type of emergency. They can even be life-saving in some situations. In short, today, a cellphone has become as basic as other utilities we use daily such as heat and hot water. Cellphones allow people to communicate at any time. Also, unlike landline phones, cellphones are mobile, lightweight, and can be used to conduct almost any type of business including ordering groceries, calling 911, speaking to family, and paying bills. You can even use your cellphone to apply for a job, set up an interview, and give an interview. While the benefits of cellphones are clearly plenty, the fact is that there are some people who still cannot afford a good phone. Many have to compromise on quality and/or features in order to be able to afford one. However, now there is a way to get free cellphones, and that is through Simply Cellphones. Below is our Simply Cellphones review. Click here to learn more about Simply Cellphones and see if you qualify for a free phone! Simply Cellphones offers free cellphones. And before you even ask the question, no, the website is not a scam or a gimmick. All you have to do is register and apply for the cellphone. If you meet their criteria, you get a free cellphone. The Simply Cellphones free phone program is a federal program designed to assist people in need. The goal is to ensure that low-income families and individuals have the ability to use telecommunications services at affordable rates. In order to get a free cellphone from Simply Cellphones, you first have to register on their website. You have to be an American citizen to be able to register or even qualify for a free phone. This company does not provide free cellphones to refugees, immigrants, green card holders, or any other group. You have to be an American citizen with a bona fide home address. You also have to provide proof of income, as only those with a low income or those who are on social security or are not able to make ends meet can qualify for a free phone. In general, people who qualify for free cellphones may be on social security income, living on food stamps, using Medicaid, relying on public housing assistance or may be in need of other government assistance program. If you satisfy the criteria, the phone is sent to you by mail. If you’re struggling to make ends meet and are in need of a phone, click here to submit an application and see if you qualify for a free phone! As long as you are an American citizen, Simply Cellphones will give a free cellphone in any state you reside in. Their free phone program is really amazing. Simply Cellphones is a government-backed program. Since cellphones are now integral to our lives, the government wants to make sure that people who cannot afford to have one are not prevented from communicating and making important connections. For example, a cellphone can help you get in touch with a potential employer if you’re looking for a job. A free phone can also allow people who are sick to stay in touch with their doctor or call a healthcare provider in case of an emergency. Finally, there is no other efficient way to stay in touch with your family except through a cellphone. Learn more about Simply Cellphones opportunities to get a free phone right now! The good thing is that Simply Cellphones does not conduct a criminal check or even a credit check. All they do is verify that you are an American citizen and that you meet their income criteria. There are no additional hassles or obligations. Simply Cellphones provides only one free cellphone per household. However, in some cases, it may give another free phone to another person in the household, as long as they meet the above-stated criteria. Simply Cellphones will only give you a free phone. The rest is up to you. That means that you are responsible for activating the phone and getting a cellphone provider. That is not much of a problem these days. The cellphone industry is highly competitive, and there are numerous companies out there that offer excellent call, text and data packages. It is up to you to determine which plan is good for you. Choosing a provider is generally based on your usage. You need to determine how frequently you will use your phone, what time of the day, how often will you use text messaging, whether you will need mobile data, and so on. The pricing varies considerably, so it is important to speak to several providers before you make your decision. Click here to register on the Simply Cellphones website today and see if you meet their criteria for receiving a free cellphone. Even though people might think a platform like Simply Cellphones might be a scam, the fact is that it is a government-sponsored program. This Simply Cellphones review is here to tell you that this plan was especially designed for those who are at a financial disadvantage. Even though we may not realize it, there are many people in our society that cannot afford a good cellphone. This program enables them to stay in touch with employers, friends, and family. The cellphones from Simply Cellphones are not old or outdated. While you may not get the latest iPhone, you will still manage to get a good phone. It might be refurbished. It might not be the latest model. But it will be a phone that is fully functional. Androids are the most commonly used smartphones these days, and most people who get a free cellphone from Simply Cellphones end up with an Android. You can use them for verbal communication, sending text messages, calling long distance, and asking for 411 assistance. The phones also have caller ID features and call waiting. Calls to 911 are absolutely free. If you think that just because it’s a free phone, it will be an old one, you are mistaken. You can get a proper smartphone from this website if you qualify. What type of phone do you like? What about a free one with all the basic features and more? Click here to learn more! Our Simply Cellphones review will now take a closer look at the program requirements. Find out whether Simply Cellphones operates in your state. Go through the eligibility requirements for your particular state. While the basic criteria are constant across the country, there might be certain state-specific conditions that you should be aware of before you apply for your free phone. Look at the phones they offer. In some cases, you might even be able to get a phone plan. Do your research and make an informed decision. Enroll online and fill out the required information. You will be asked questions about your income since this is a program designed for low-income families. Wait for their decision, and if you qualify, you will receive your phone in the mail. Click here for more information about how to get a free cellphone and never fall out of touch with your loved ones ever again! In some cases, if you are really poor, living on social security, and relying on Medicaid, some phone companies will give you a free phone plan. These plans have limited service, but you will be able to make local calls and send text messages. However, you have to meet specific criteria of these phone companies to be eligible for a free phone plan. A word of warning: do not keep your hopes too high because this is not common. Just be thankful if you manage to qualify for a free phone. Deciding which phone service or phone plan to use is a matter of personal choice. It also depends on how much usage you need. Verizon Beyond Unlimited is an excellent phone plan; the prices vary from $30-$75. The Simple Mobile 6GB plan offers the best-prepaid plan. If you only plan to use your phone during emergencies and the occasional chat, then a prepaid plan is the way to go. Simple Mobile offers prepaid plans starting at $10, and you can simply reload when the money runs out. However, be warned that if you use the cellphone frequently, this plan can become quite expensive. T-Mobile ONE Plus also offers a good phone plan, but it is slightly more expensive, starting at $40/month. Total Wireless 25 GB plan is another prepaid family plan which has low rates. It is ideal for people who do not use the cellphone regularly but only for emergencies. If you have bad credit, the chances are that most cellphone companies will not offer you a long-term plan. In such a case, it is best to go with a prepaid plan which usually does not require a credit check. All you need to do is pay a security deposit and find a co-signer. Simply Cellphones runs no criminal background or credit check when evaluating applications for a free phone. All you need to do is submit proof of income! Many people question the authenticity of a platform such as Simply Cellphones. This is not surprising since the Internet these days is full of scams and frauds. After all, one would wonder why anyone would just give them a cellphone for free? Well, the answer is that NOT everybody can get a free cellphone from Simply Cellphones. You have to meet the eligibility criteria to be able to qualify. This is a government-sponsored program, and so the approval process is quite thorough. Some people might try to get a free phone by lying about their income or their financial situation. But remember, the government has access to your information – from your income to your latest tax returns. You do not want to lie or make a mistake at this point. If you really want a free cellphone, make sure you qualify for the program. Also, make sure you put in accurate and authentic information. Just don’t think you will fill up any information online and just get a free phone which you can either give to a friend, donate, or sell to make cash. It is never a good idea to engage in such activities. Moreover, the government is trying to help people in need. Those who try to take undue advantage of the government’s generosity can end up depriving others who might actually be in need of a phone. The biggest proof of the legitimacy of this platform is the fact that not everybody who applies for a free phone gets it. Their process of elimination is very thorough, and they are trained to determine which application is genuine and which isn’t. Therefore, it’s best not to lie or cheat the government. Be honest and see how it turns out. Register with Simply Cellphones today and make sure you meet all eligibility criteria to get a government-sponsored free cellphone! 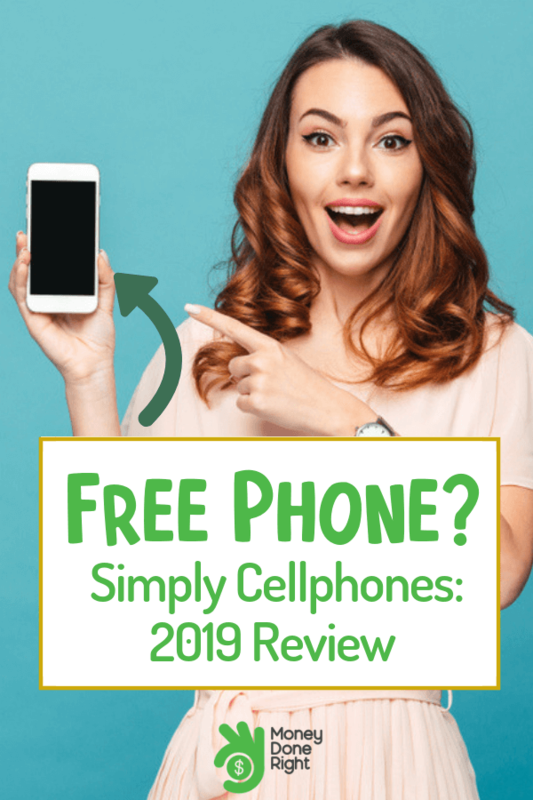 If you fall in the low-income bracket and if you have no tool with which to connect with people (family, friends and/or employers), it is time that you tried Simply Cellphones. Trust our Simply Cellphones review when we say that this is a 100% legitimate program sponsored by the U.S. government. The platform is easy to use and even more easy to navigate. You can talk to different agents about the process as well as your chances of getting a new phone. But if you really need a phone, don’t give up so easily. Try it out. There are many situations where the government evaluates the submitted information and determines who qualifies. Sometimes, more than one person in the family qualifies too. If you have been facing difficulties buying a good phone and if you really need a phone to stay in touch with your family members, apply now through the online form at Simply Cellphones and try your luck! Are you familiar with the Simply Cellphones program? Let us know what you think about it and its eligibility criteria in a comment below!